It is hard to believe that June is here, but it is! I’m eagerly looking forward to what this summer has in store. On that note I thought it would be fitting to whip up some delicious veggie dip to use up all those glorious vegetables from the farmers markets. So tell that white stuff they call veggie dip to stay on the shelf where it belongs. This dip is incredibly easy, tastes better, and you know exactly what’s in it. No high fructose anything insight. 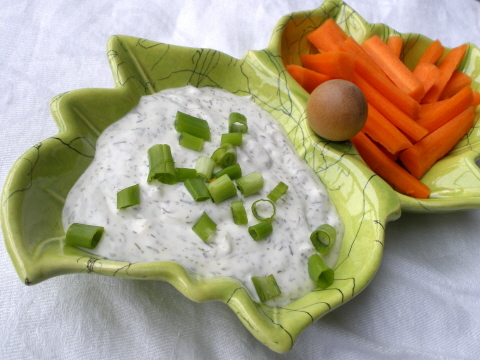 Looking for another veggie dip idea? You might want to try Tofu Green Goddess Dressing as an interesting alternative. 1 tablespoon dry dill – or use fresh if you have it! Combine all ingredients in a air tight dish. Allow to chill at least one hour before serving. Then dip at will!